In this EM Cases episode with Dr. Nazanin Meshkat, multinational ED doc and Dr. Matthew Muller, infectious disease specialist, we discuss the most common tropical disease killers that we see in patients who present with Fever in the Returning Traveler. Every year an increasing number of people travel abroad, and travelers to tropical destinations are often immunologically naïve to the regions they’re going to. It’s very common for travelers to get sick. In fact, about 2/3 of travelers get sick while they’re traveling or soon after their return, and somewhere between 3 and 19% of travelers to developing countries will develop a fever. Imported diseases, like Malaria, Dengue, Ebola, and Zyka can be acquired abroad and brought back to your ED in unsuspecting individuals. This is serious stuff – you might be surprised to learn that Malaria is responsible for more morbidity and mortality worldwide than any other illness. According to a study in CJEM most emergency physicians have minimal or no specific training in tropical diseases and emergency physicians indicated an unacceptably low level of comfort when faced with patients with tropical disease symptoms. In fact, 40% of the cases were incorrectly diagnosed or managed. And Canadian ED docs aren’t the only ones who’s skill isn’t stellar in this department – a similar 2006 study of UK physicians showed a 78% misdiagnosis rate. This misdiagnosis rate isn’t wholly because of lack of knowledge – it almost certainly also has to do with the vague presentations and huge amount of overlap between so many tropical disease. You might be thinking that it’s impossible to learn all the thousands of details of the dozens of different tropical diseases – true. However, in the ED, while we don’t need to know every detail of every tropical disease, and don’t necessarily need to make the exact diagnosis right away, we do need to have a rational, organized approach to diagnosing and managing fever in the returning traveler, so that we can identify some of the more common serious illnesses like Malaria, Dengue and Typhoid fever, and start timely treatment in the ED. The topic for this podcast was chosen based on a needs assessment conducted by Dr. Meshkat and published in CJEM in 2014. Podcast recording April 2015; written summary and blog post by Keerat Grewal and Anton Helman, March 2016. Fever in the returning traveler is usually not caused by a dangerous tropical disease. These patients are much more likely to have typical viral illnesses as a cause for their fever. Nonetheless, all patients who return from traveling to a tropical destination with a fever require consideration of the common deadly tropical diseases: Malaria, Dengue and Typhoid fever. A 60 year-old male, presents with a fever to your ED. He recently returned from India, where he spent 3 weeks visiting relatives. He has no significant past medical history. Immunizations are up to date. He did id not receive any travel immunizations or malaria prophylaxis. The fever started 2 days ago, and is associated with cough and chills. In the ED his vital signs are: Temp 38.4°C, BP 135/85, HR 120 bpm, RR 22 and O2 saturation 94% on RA. Q: What else do you want to know? What important questions should you ask on history for fever in the returning traveler? A: While it seems obvious here, one of the common errors that emergency providers make in assessing fever is simply forgetting to ask a travel history and thus missing the deadly tropical disease diagnosis that has a vague presentation. Q: What features should you look for on physical exam in the returning traveler? Q: What investigations should be considered for fever in the returning traveler? Malaria Screen: thick and thin smears are required every 12 hours until there are three negative smears. Three negative smears are required to rule out Malaria as parasitemia is cyclical. A 35 year-old male presents to the ED with multiple seizures. Initial glucose is 2.1. He receives 2 amps of D50W and 2mg of IV lorazepam. After 2 more doses of lorazepam the seizures stop. Vital signs are: Temp 40.1°C, BP 78/43, HR 112 bpm, RR 34, O2 saturation 89% on a NRB. 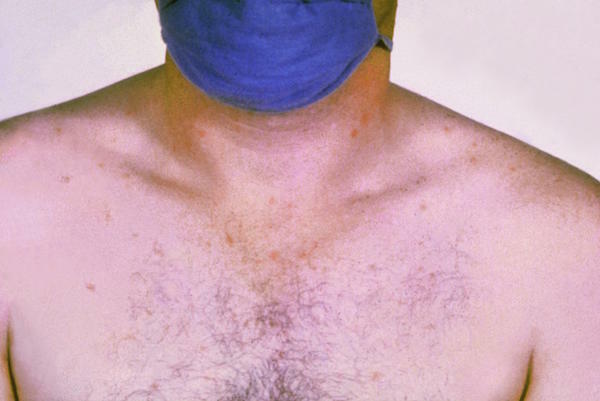 On exam, he is pale and diaphoretic. He has a decreased LOC, not following commands, but localizes to painful stimuli. Youhear bilateral crackles on respiratory exam and palpate diffuse abdominal tenderness with no peritoneal signs. He has no rash, no neck stiffness, and no meningismus. Collateral history reveals that he had recently been traveling to South Asia. Q: What is your differential diagnosis for this patient at this point? Q: What is the clinical presentation of Malaria? A: Fever is very common; 90% of patients will have or describe a fever. The fever may be the classic cyclic fever described with malaria that recurs every 2-3 days, or it may be continuous. The ‘classic triad’ in Malaria, like all ‘classic triads’ is nonspecific and insensitive. The ‘classic triad’ is fever, splenomegaly, and thrombocytopenia. Besides fever, the remainder of the presentation is fairly nonspecific. Symptoms like headache, cough, and GI symptoms are vague and can mimic other febrile illnesses such as influenza. Patients with malaria will usually present with headaches, fever, myalgias and joint pain. They may have nausea, vomiting and diarrhea. Don’t be fooled into making the definitive diagnosis of traveler’s diarrhea if the patient presents with fever and diarrhea – they may have Malaria. More severe cases usually are jaundiced. The fever may be the classic cyclic fever described with malaria that recurs every 2-3 days, or it may be continuous. So, patients with Malaria may present to the ED without a measurable fever due to the cyclical nature of Malaria, however the fever is not cyclical in all patients with Malaria. Q: What are the species of malaria that ED physicians should know about? Malaria can be caused by six known species of Plasmodium and is spread by the Anopheles mosquito. This mosquito bites at night; thus, people who sleep in screened or air-conditioned rooms have a lower risk of contracting the disease. A: P. falciparum is the species most likely to cause severe Malaria and death. Any cases of suspected Malaria should be considered to be P. falciparum until proven otherwise. P. knowlesi has recently emerged in southeast Asian countries, and can cause severe and fatal infection. This should be treated similarly to P. falciparum. P.vivax, P. malariae, P. ovale are other forms of Malaria that are less severe. P. knowlesi is usually misdiagnosed as the less aggressive P. malariae, as the two are identical under microscopy. So any patient from Asia with a high parasitemia should be considered to have P. knowlesi until proven otherwise. Q: What is the significance of the parasitemia level in Malaria? A: A parasite load of > 5% parasitized RBCs indicated severe malaria. While a high parasite load is fairly specific for severe Malaria and hence trigger a consideration for immediate IV anti-malarial medication, the parasite load may change over time and so patients who are found to have, no parasite load or a low parasite load should still be considered for empiric treatment with anti-malarials, as the subsequent smears may show increasing parasite loads. Do not rely on a single smear to rule out Malaria. The first smear is negative in 10% of patients because of fluctuating levels of parasitemia. Pitfall: It is important to realize that interpretation of the Malaria thick and thin smears are highly dependent on the experience of the reader in the lab. It is not uncommon for the the species of Malaria to be misidentified as well as the parasite load be miscalculated. A common pitfall is not treating a patient who’s smears show a less severe species with a low parasite load. All patients who present with severe malaria clinically should be presumed to have P. falciparum or P. knowlesi and treated with IV anti-malarials immediately, while less severe cases should still be considered for oral therapy and adminision even when a less severe species is identified in the smear with a low parasite load. Q: What results would you expect on the CSF from an LP of a patient with cerebral Malaria? A: Often the CSF can be normal. You may see a slightly elevated opening pressure and elevated protein concentrations. Lumbar puncture is indicated in fever in the returning traveler who have an altered level of awareness to rule out bacterial meningitis. Q: Which patients with suspected Malaria require IV anti-malarial medications immediately? A: Severe malaria is characterized by significant organ dysfunction, anemia, electrolyte abnormalities or cerebral malaria (altered mental status, seizures or coma). Severe malaria is a medical emergency that must be treated aggressively. If a patient meets criteria for severe malaria, they should be started immediately on empiric IV anti-malarials pending the results of the thick and thin smears. These criteria include findings from the smear plus clinical features such as anemia, impaired consciousness, recurrent seizures, shock with a SBP < 80, prostration with extreme weakness, acute renal failure, ARDS, severe hypoglycemia, spontaneous bleeding or DIC, macroscopic hemoglobinuria or jaundice. Quinidine (with doxycycline) or Artesunate are parenteral anti-malarial options. In a Cochrane review, Artesunate was shown to be superior to Quinidine in reducing mortality from Malaria, however, it is not available in all EDs. If Artesunate is not immediately available, our experts recommend Quinidine plus doxycylince for empiric treatment of Malaria. IV Quinidine can be cardiotoxic, cause hypotension, ventricular arrhythmias and QT prolongation; thus, the patient should be on a cardiac monitor during administration. Q: Which patients with suspected Malaria should be considered for hospital admission? While there are no clear guidelines on disposition for patients with suspected Malaria, our experts recommend that all children and most adults with suspected Malaria should be considered for hospital admission as initial smears can be misleading, response to therapy is highly variable, and patients can rapidly deteriorate. Failure to recognize travel as an element of the history. Ask about travel in every patient who presents with fever. Assuming that a patient who returns from a region known to have Malaria many months later cannot have Malaria. Malaria has a typical incubation period of 8-25 days, but can have an incubation period of up to 12 months. Assuming that if the patient is afebrile in the ED or doesn’t have the typical cyclical fever, they do not have Malaria. Assuming that the chemoprophylaxis taken is the correct regimen, that the patient was compliant, or that chemoprophylaxis rules out Malaria. Ruling out Malaria because the patient does not have the classic triad of fever, splenomegaly, and thrombocytopenia. Relying on a single smear to rule out Malaria. The first smear is negative in 10% of patients because of fluctuating levels of parasitemia. In highly suspicious cases, failure to detect parasitemia is not an indication to withhold therapy. If there is a clinical suspicion of Malaria, repeat smears every 12 hours until there are three negative smears to rule out Malaria. Misinterpretation of the smear by an inexperienced lab technician. P. knowlesi is usually misdiagnosed as the less aggressive P. malariae, as the two are identical under microscopy. Any patient from Asia with a high parasitemia should be considered to have P. knowlesi until proven otherwise. Delaying treatment for suspected Malaria. A delay in treating P. falciparum > 6 hours is associated with worse outcomes. Do not delay treatment while awaiting lab confirmation. The CDC has an algorithm to help you manage malaria. 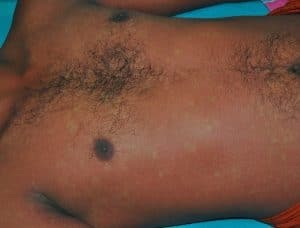 A 21 year-old female presents to your ED with fever and chills for 10 days. She complains of fatigue, headache, malaise and crampy abdominal pain. She is more constipated than usual. She has no past medical history. She has recently traveled to Peru. Her vital signs are: Temp 38.2°C, BP 115/60, HR 43 bpm, Oxygen saturation 98%. On exam, appears well. Her GCS is 15 and her neck is supple. Her abdomen is slightly distended, with mild diffuse tenderness, but no peritoneal signs. There is no rash. All immunizations are up to date. In Peru, she stayed in homes and mostly urban areas, but also went hiking. She took malaria prophylaxis before and after the trip, but may have missed 1-2 doses. Her CBC is normal, she has mildly elevated liver enzymes. The blood culture comes back later positive for Salmonella Typhi. Q: What are some of the clues in the history that point to Typhoid Fever? A: Relative bradycardia is often described in Typhoid Fever, however, like many of the signs of Typhoid Fever, relative bradycardia is nonspecific and insensitive for the diagnosis. While many patients with Typhoid Fever suffer from diarrhea, constipation can be seen in 40-50% of patients. Look for rose spots on the trunk and extremities – salmon-colored, blanching, maculopapules usually 1-4 cm wide and fewer than 5 in number which generally resolve within 2-5 days. The classic description of the fever pattern is stepwise, with a rising temperature over the course of each day that drops by the subsequent morning. The peaks and troughs rise progressively over time. Again, this is nonspecific and insensitive for the diagnosis. Q: How is Typhoid Fever diagnosed? A: Positive blood cultures for Salmonella Typhi. Gram negative bacilli are seen on gram stain. These results typically will not be available to the ED physician, so in the ED the diagnosis is usually presumptive based on clinical features. Salmonella Typhi can also grow in urine and stool cultures, but these are less sensitive than blood cultures. A 30 year-old female, returned from the Dominican Republic one week ago. She presents to the ED with a 3 day history of fever, headache, myalgias, and a petechial rash on her extremities. She is otherwise healthy. Immunizations are up to date. She received malaria prophylaxis. Her vital signs are: Temp 38.4°C, HR 120 bpm, RR 22, O2 saturation 94% on RA and normal BP. She has no signs of meningismus. Lab results includ WBC 3.2, platelts 80, and malaria smears x 2 are negative. Your differential diagnosis includes Malaria, Typhoid Fever and Dengue Fever. Q: How is Dengue transmitted and how does it present? A: Dengue, or breakbone fever, is viral hemorrhagic fever that is transmitted by mosquitos and carries a high morbidity and mortality. There is a wide breadth of presentations, making this a difficult diagnosis. The incubation period is 3-14 days, with most patients presenting within the first week. Only some patients with Dengue present with the classic saddle back fever, a bimodal fever that persists for 3 days, resolves, and peaks again in 1-2 days. Positive tourniquet test (inflate BP cuff and leave it inflated for 5 minutes, on deflation, look distally for petechiae). Q: How do you differentiate between Dengue and Chikungunya? A: Dengue and Chikungunya are similar diseases; they are both acute febrile illnesses associated with exposure to mosquitos in appropriate parts of the world that usually present with headache and myalgias/arthralgias. As such, both diseases should be worked-up in patients returning from endemic areas. However, Dengue can lead to severe manifestations such as Dengue Hemorrhagic Fever, or Dengue Shock Syndrome, which is not seen in Chikungunya. The arthralgias in Chikungunya can lead to arthritis lasting for several months after the initial illness. Q: How does Dengue septic shock present? A: Dengue septic shock occurs as the patient defervesces and lasts two to three days. A massive plasma leak occurs, leading to pleural effusions, ascites and hypovolemic shock. Patients also develop thrombocytopenia and DIC with massive hemorrhage. Treatment is supportive with red cells and judicious fluids.